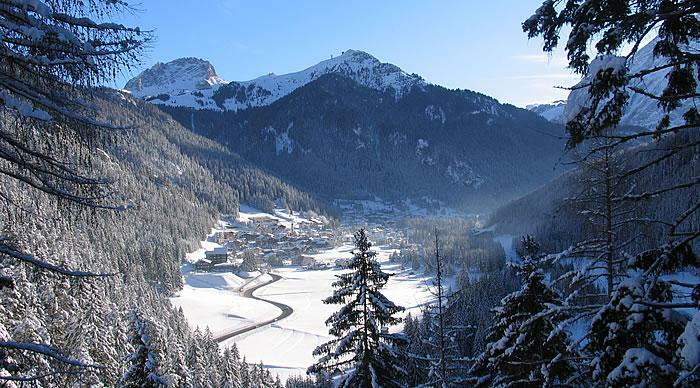 Between Moena and Canazei is one of the greatest Italian winter resorts - Val di Fassa. 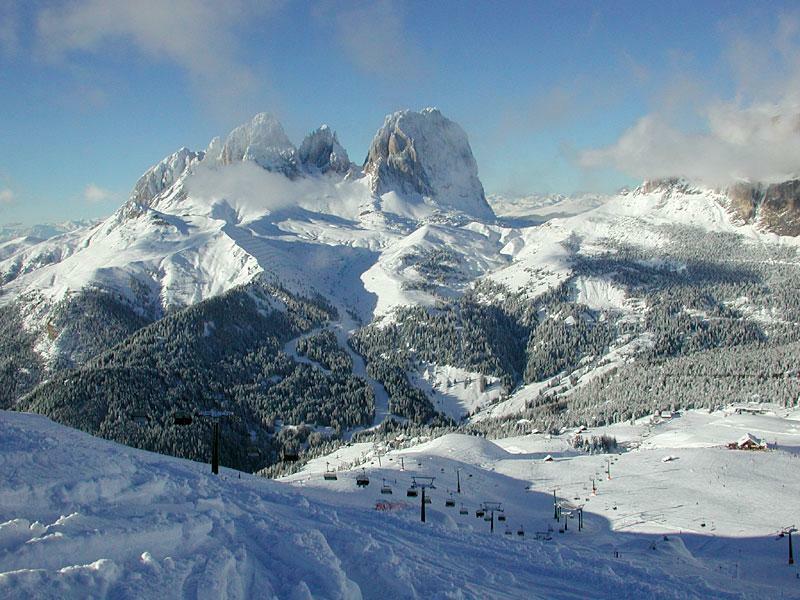 Across a length of 20 km there are seven ski stations, which together with the famous Sella Ronda are one of the best skiing offers in the Alps. 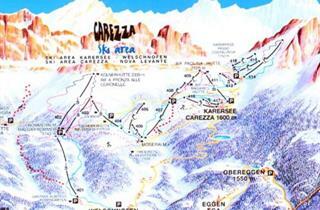 No wonder that crowds of skiers come to the area of ​​Canazei and Campitello every year from every corner of Europe. Undoubtedly, the biggest local attraction is Sella Ronda. 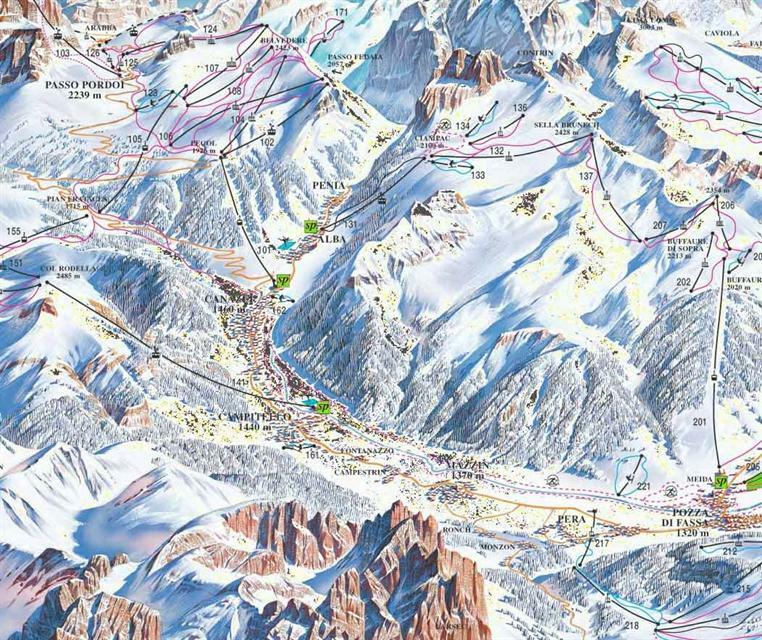 This gigantic ski network connects Val di Fassa with the Val Gardena, Alta Badia and Arabba-Marmolada ski resorts. 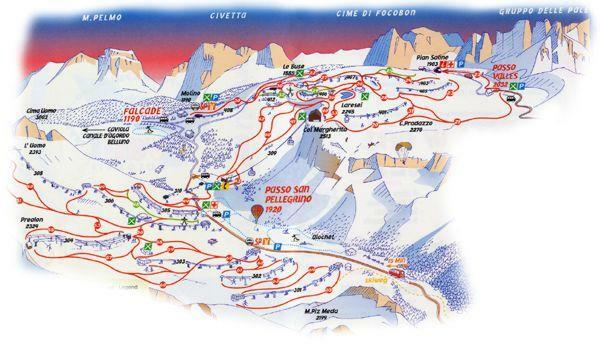 The gigantic massif of Sass Pordoi can be circled going in both directions, clockwise and anticlockwise. Members of the local community argue that the green trail is easier than the orange one. In both cases, it takes 4 to 6 hours to complete them, depending on the pace and skill of the skier. 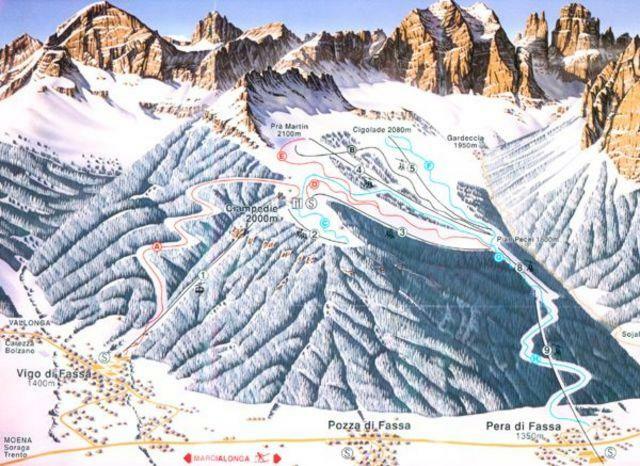 In my opinion, it’s worthwhile to take a tour of Sella Ronda on the second day to quickly figure out which ski runs are most suitable for you. 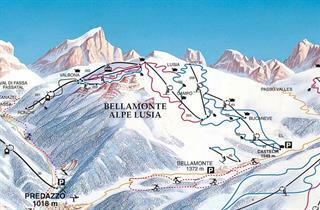 At the opposite end of the valley you can find the Alpe Lusia-Bellamonte ski station. 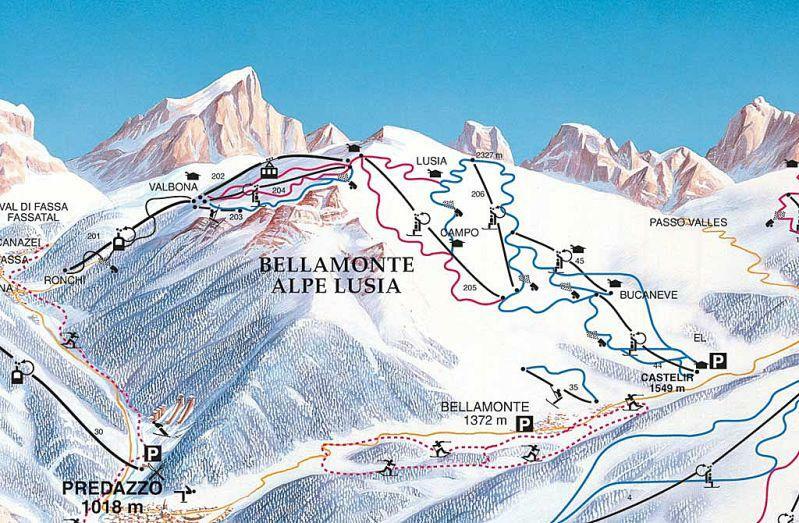 26 km of trails have been made available between Moena, which lies at the gateway to Val di Fassa, and Bellamonte, which belongs to the neighbouring ski area of ​​Val di Fiemme. 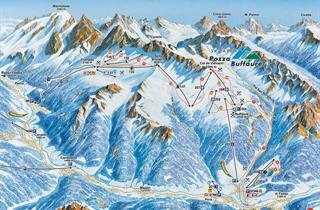 The local ski routes are mostly easy and intermediate, but fans of black runs will find 6 km of such trails here. The lower lift station is located 3 km from Moena, it takes approx. 5 minutes to get there by ski bus. 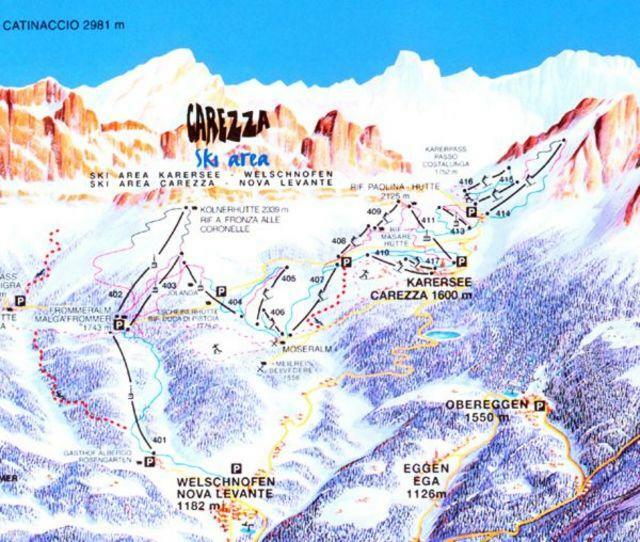 The Carezza-Karersee ski station is hidden on the sidelines of the valley. To get to it, you need to cross the Passo Costalunga pass. 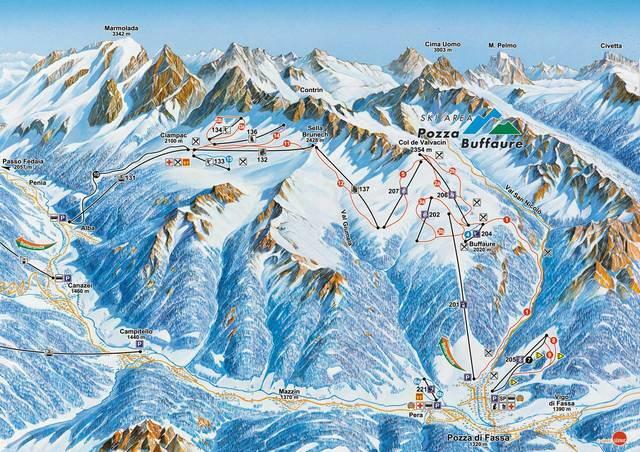 At an altitude of 1100–2300 m above sea level there are 40 km of mainly easy and intermediate runs. The most difficult of these is the 2.5-km black-and-red Koenig Laurin trail. 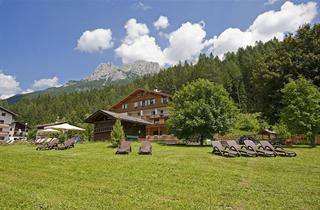 16 km of medium and easy routes are offered by the Ciampedie resort, accessible from Vigo di Fassa and Pera di Fassa. Trails routed up to the peak at 2000 m.a.s.l. of the same name can be a good option for beginners and families with children. 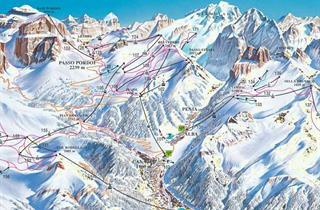 There won’t be any crowds here, because most newcomers direct the tips of their skis in the direction of Sella Ronda. 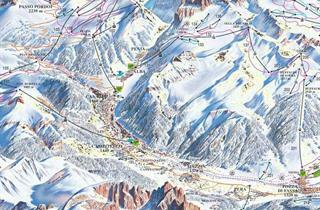 The last station belonging to Val di Fassa is Buffaure-Ciampac. 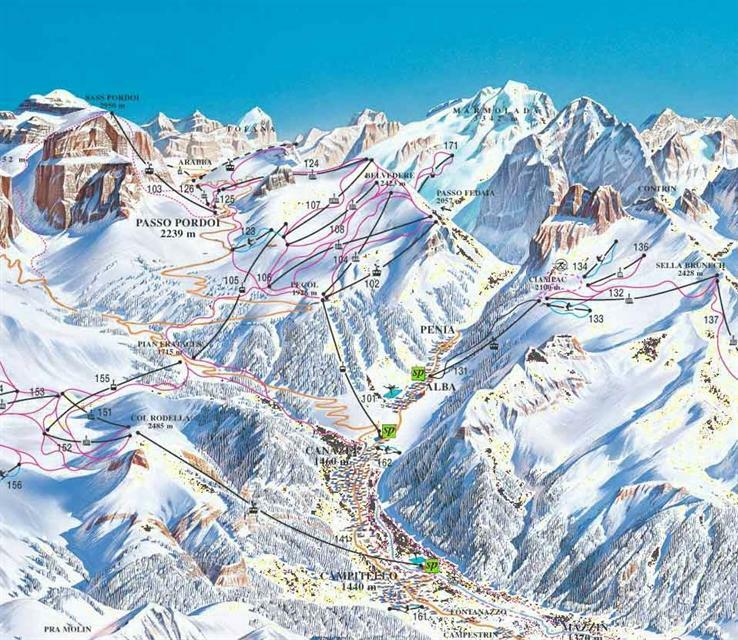 It is 32 km of mainly red ski runs between Pozza di Fassa and Alba di Canazei. 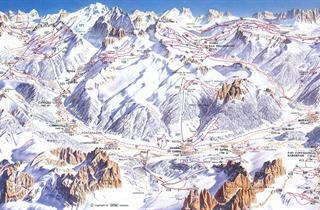 The first town is a typical alpine resort with a small town square and a large number of apartments and hotels. In turn, Alba is rather a suburb full of hotels, apartments and nightlife opportunities of Canazei. The station itself offers mostly pleasant, not very frequented trails, great to begin a week’s stay. Many experts visit the black Ciampac trail leading to Alba - this is definitely a strong point on the map of the valley. 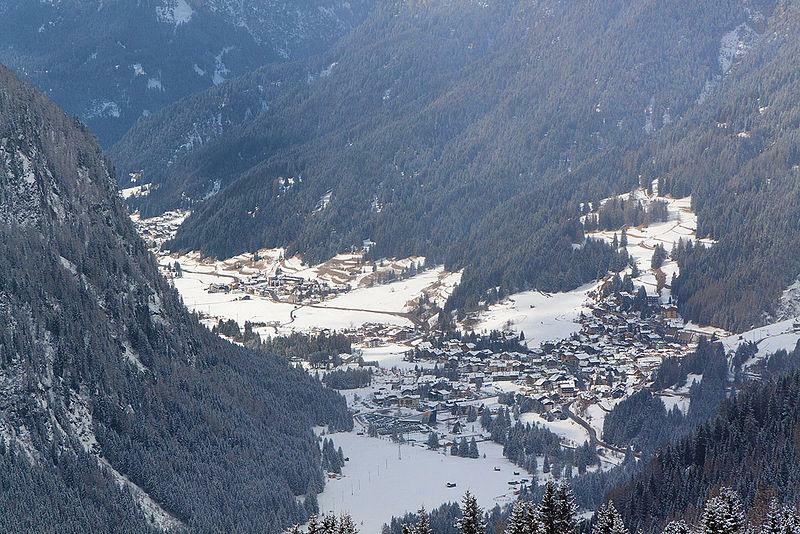 Starting from the 2015/16 season, a gondola will be launched in Alba, connecting the Buffaure-Ciampach ski station with Sella Ronda. 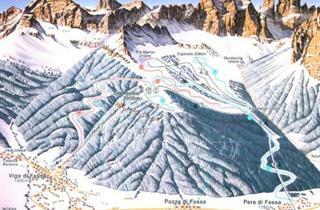 Plenty of attractions have been prepared in Val di Fassa for all skiers and snowboarders. Almost every resort belonging to Sella Ronda has a snow park, and trails for skiing off-piste are right next to trails prepared every night by snowcats. An absolute highlight is the possibility of off-piste descent from Sasso Pordoi, which is 2950 m high – you can ski down on powder snow between rocks, preferably in the company of a local instructor. Cross-country skiing enthusiasts can train on the tens of kilometers long Marcialonga trail, which runs through the whole valley and leads to Cavalese, lying in the neighbouring Val di Fiemme. 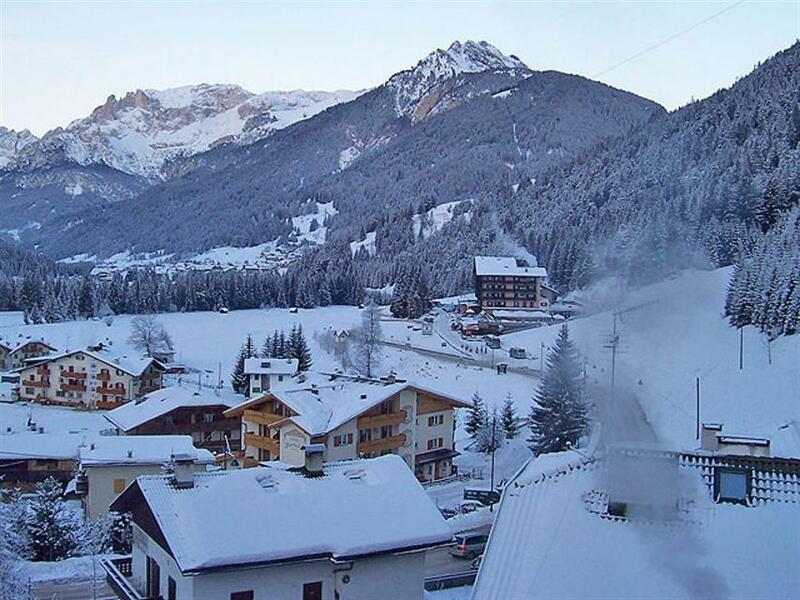 When choosing to ski in Val di Fassa, you can pick from offers of accommodation from many towns. 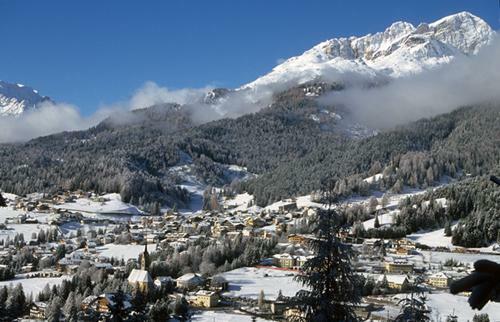 Canazei, considered the main town of the region, offers fairly expensive hotels but also easy access to Sella Ronda and great après-ski life. Nearby Campitello, more of a family resort, where prices are slightly lower (check our apartments in Campitello. 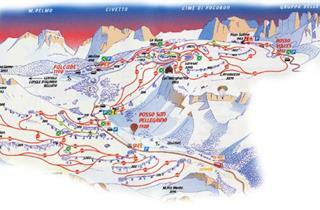 Those seeking accommodation with full board at a good price should consider the hotels in Pozza di Fassa. 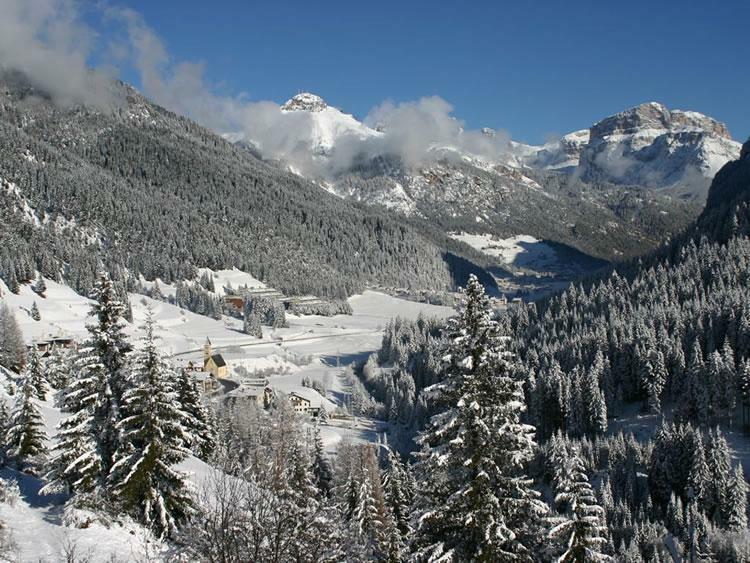 This town, from December 2015, will be connected with Sella Ronda, and the accommodation prices here are even about twenty percent lower than in Canazei. I like the best, huge choice of pists with something 1200 km total length, well equipped with ski-lifts long routes, such as Sella-Ronda and Marmolada. There were no bad surprises for me at all. I would definitely choose Canazei resort again! Nadgorliwi stróże prawa, zamiast udzielić pomocy, informacji w sprawie parkowania od razu z dużą satysfakcją wręczają mandaty.